Provided photo Electrical Trades students are leading the annual coat drive at UVCC. They have filled a crate with just some of the 130 coats collected to date. PIQUA — The Upper Valley Career Center is teaming up with the Miami County Sheriff’s Office and Sunset Cleaners for the 28th annual Operation Cover-Up Coat Drive. 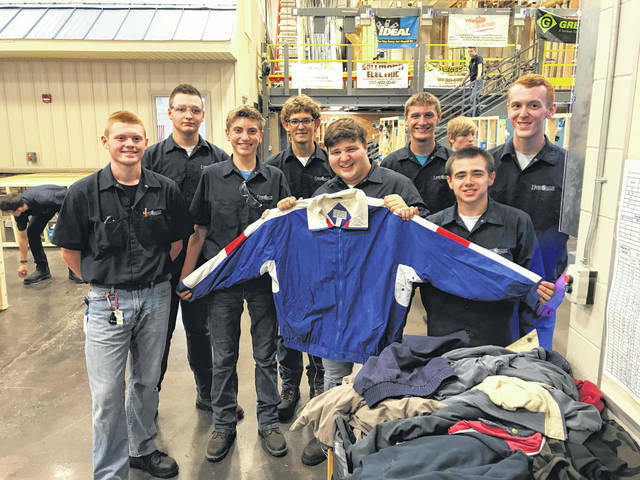 The Electrical Trades program within the district is leading the effort and challenging each of the 24 career-focused programs at the school to collect as many gently-used coats as possible by the end of the school day, Wednesday, Oct. 17. The program with the most coats collected will receive a pizza party as their reward. This friendly competition is for a good cause, as parents and guardians can visit the Miami County Fairgrounds Shop and Crop Building on Saturday, Oct. 27 from 9-11 a.m. and receive free coats for children. To help the UVCC in this effort, reach out to a UVCC student or simply deliver gently-used coats to the school’s front desk from 8:30 a.m. to 3:15 p.m. Monday-Friday through Oct. 17. Donations can also be made directly to Sunset Cleaners through Oct. 22. For more information, cal the Electrical Trades at 778-1980, or contacting the Miami County Sheriff’s Office at 440-6085.
https://www.dailycall.com/wp-content/uploads/sites/30/2018/10/web1_IMG_6219.jpgProvided photo Electrical Trades students are leading the annual coat drive at UVCC. They have filled a crate with just some of the 130 coats collected to date.